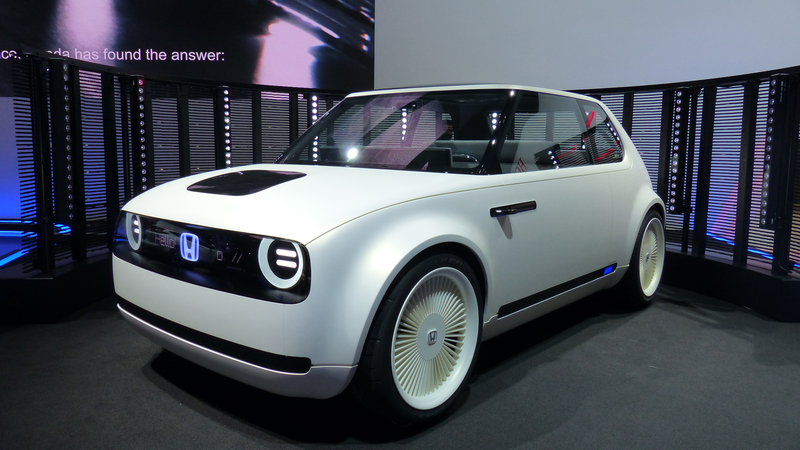 After a string of boring silver suppositories calling themselves “concept cars” at the 2017 Frankfurt Auto Show, Honda’s Urban EV concept is like a slap in the face with your favorite sandwich: surprising, but delightful. It’s an all-new electric platform for Honda, though the character and look are clearly based on the first-generation Honda Civic. I love it. ... which is exciting, though the lack of the word “America” in there saddens me, I can’t say I’m all that shocked. Still, I’m going to quietly hope future plans will include the U.S. The design of the Urban EV is a great example of how to do retro right; the silhouette and proportions are clearly derived from the first-generation Civic, which is especially notable in the C-pillar, but the whole design vocabulary is extremely clean and modern. The front grille area is a actually a dot-matrix LED display screen, like we’ve seen on Mercedes’ concept cars, and while that’s unlikely to make it into production, the backlit Honda badge just might. The headlights have an open circle outer ring suggesting the old round sealed-beams of the Dark Ages, but incorporate an equals-sign-shaped interior element. The doors are suicide doors, a nice little surprise, and the overall body lines are crisp and uncluttered. The black ‘bumper’ areas are interesting, as the ones on the side seem to incorporate an external battery charge state indicator, I guess in case you want to check on your charge level from across a street? Or let everyone know what can be expected of you, range-wise? The interior design is especially nice: it has two bench seats (!) and what may be the widest display I’ve ever seen on anything I didn’t have to buy tickets to. The use of materials is very nice, and closer to interior architecture design than the usual automotive sorts of things; that bench seat absolutely reads like a couch. Also interesting are the displays on the inner door panels, which I suspect are meant to be views from the rear-view side cameras? I’m really taken by the look and feel of this thing, though David Tracy, our man in Frankfurt, says it’s being sort of ignored at the show, sitting forlorn in a corner. What the hell is wrong with people? He also mentioned that this is very much a concept car, with those interesting multi-multi-spoke wheels not even touching the ground. It’s more sculpture than car, he told me. Still, I’m going to hope that Honda is serious and this will be a direction for some of their future small electric cars. They already have proven an ability to make space-efficient and charming retro-inspired cars with vehicles like their N-Box Kei cars, so they have a track record. Come on, Honda. At least consider the U.S. market for this fun stuff; I know at least some of us won’t ignore you like those snobs at the Frankfurt show! Also, how about a little electric folding scooter in the hatch?